Jacquie Severs: Grunge 2.0 - Docs Coming Back? Grunge 2.0 - Docs Coming Back? t lunch on friday there was a discussion about 'guys with long hair.' Amusingly, the two guys at the table both had long hair in the 90's. I accused them both of wearing their long hair with plaid shirts, light coloured jeans and Docs, and boy was I right. They both admitted to this look. Fashion experts say 'grunge is back', and I guess in a lot of ways they are right. Plaid, ripped jeans and vintage shopping are all back in vogue, and it could be connected to the economy. In the mid-to-late nineties, it was an era of scaling back, as we were in a recession then, too. It seems natural that if a grungy, working-class look is coming back, that the staple footwear of that time would too. Yep, I'm talking Docs. Doc Martens turned 50 years old last week. But really, they go back a lot farther than that, with early incarnations of the company going back as far as 1901. 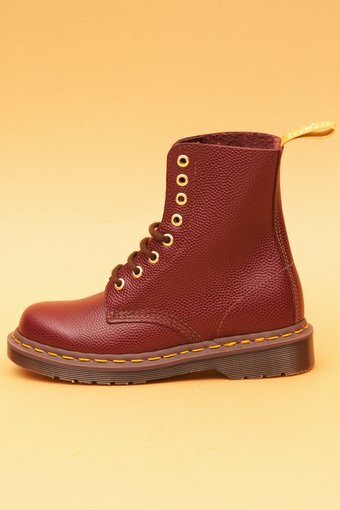 The first DM eight-eye boot began production in the U.K. on April 1, 1960. It was developed for factory workers, bobbies and mail carriers, but it was quickly adopted by skinheads who began emerging in Britain in the middle of the decade. The resulting irony was that young rebellious types, and "the man" were wearing the same boots. But like all things 'subculture' they eventually became so popular that they were mainstream. By the 1990s, the movement was in full force. Docs were being sold in the U.S. to teens from upper-class homes. They bought the same styles from shopping malls that subculture rebels had once purchased in the tiny shop in Camden. The brand name and logo saturated advertising, sponsoring festivals and sports teams. Annual sales globally hit about $400 million in 1999. The company started to struggle though. In the early part of the new millenium clothes became streamlined, simplified and minimal. Wearing around a clunky pair of heavy-soled army boots just wasn't fashionable anymore. In time some took sympathy with the struggling company who had grown too large to meet demand (much like any fad product - recently Crocs has suffered) and in 2003 Jimmy Choo, Vivienne Westwood, Jasper Conran and Orla Kiely reinterpreted and customized the original boot. And momentum began building behind the brand again. In 2009 Jean Paul Gaultier used them in his runway show and campaign advertising for his fall/winter collection. The shoes are made in the original factory in Wollaston, England. The 1460s are $200, and the 1461s are $180. The shoes are for release from limited locations only, (like super trendy Opening Cermony in LA) and are expected to be a fashionista collectors item. Certainly this sort of limited release creates a desirabilty in the market. Do you think Docs will again become the fashion staple they once were? Even I had a pair of cherries in the 90s. I remember getting them so clearly - it was such a big deal for me. They were three holes. I wanted the 6's at least, but I wasn't allowed to have them. I saved up babysitting money - I was in grade 7 - and we had to go to a mall 3 towns over to get them. I also remember kids making fun of me - there was only one other guy who had them in our school. He had white six holes - I guess he was really fashion forward. Those were pretty cool. Anyhow kids made fun of my 'boy shoes' but it turned out alright because within the year a few kids either had a pair or were about to get some. By the next year every kid had them, or a knock off variation. That's how trends hit. It seems to just happen. That's why I find them fascinating. I think that with the variety of shoe options available out there that Docs are unlikely to really hit it big like that again, and instead will remain a heritage brand with pared-down cool appeal - like Levi's Jeans and white Hanes Tshirts.